Check Out the New Emporium Catalog and #NSLW18 Items! A new school year brings new opportunities, new students and new Emporium merchandise to help you promote your program! If you haven’t already, make sure you check out the new Emporium catalog! 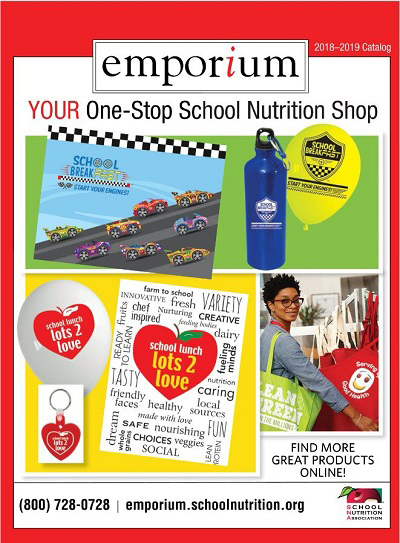 The new catalog features hot new items to celebrate National School Lunch Week (NSLW), new Child Nutrition is My Business items, new National School Breakfast Week (NSBW) items, and more! Directors and managers will also find the latest Emporium catalog in their August issue of SN Magazine. NSLW kicks off October 15 and with “Lots 2 Love” when it comes to your school lunch program, you want to be sure you start planning now to share all the reasons that make your cafeteria a special place for students to visit and the benefits of healthy food choices. Download the #NSLW18 Toolkit for social media tips, celebration ideas, resources and more. Availability on certain #NSLW18 Emporium merchandise is limited, so place your orders early before popular items sell out and to ensure delivery in time. As an added bonus, orders over $300 placed via phone or fax now through September 10 will receive a 5% discount! Mention code AUG18 when calling or faxing in your order (discount not available online). Take a look through the new catalog and place your orders today!